It's a cruel trick of Mother Nature that that most glorious weather of the gardening season coincides with the decline of most blooming plants. Not so with the aster. Like garden mums, asters flower in response to the shortening days of fall, giving gardeners a carpet of daisy-like flowers on a compact plant from August through October, depending on the variety. Although home and garden centers market asters as a seasonal impulse purchase among displays of pumpkins and hay bales, asters are long-lived perennials that you'll want to make a permanent part of your landscape. The family Asteraceae contains the genus Symphyotrichum, which encompasses the 90 or so recognized aster species. Asters also go by the name Michaelmas daisy, a nod to the Feast of St. Michael, which falls on September 29, when asters are in peak bloom. Asters are geographically diverse plants, and will grow in zones 3-8, depending on the variety. Dwarf ground cover varieties like Snowdrift may grow no taller than 4 inches. Native asters can grow up to 3 feet tall, and may require staking. Perennial asters grow on mounding or upright plants with lance-shaped foliage, producing autumn blooms in shades of blue, red, white, and pink. The flower is welcome in the fall garden to complement mums, which aren’t available in blue shades. Asters are a rich source of nectar, and because they flower at the height of monarch butterfly migration season, they are a frequent way station for these insects. The flowers are also bee magnets, so individuals with bee sensitivities should plant asters away from the garden path. Asters make a good cut flower for fall arrangements. Cut the flowers late in the evening to avoid contact with avid bee visitors. Take stems when about 1/5 of the flowers are open for the longest vase life. Choose an area with full to partial sun for your plants. Too much shade will cause lanky plants. 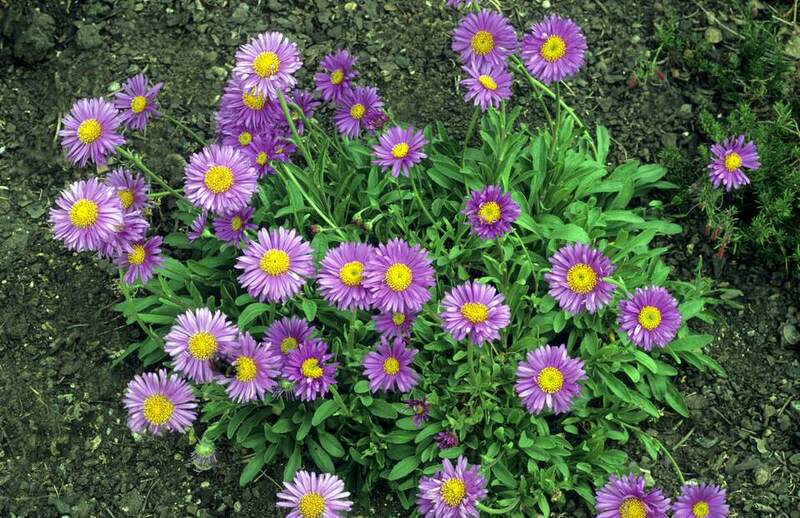 Asters appreciate soil on the slightly acidic side, with a pH ranging from 5.8 to 6.5. If your soil is alkaline, you can correct it by adding organic matter such as well-rotted manure, leaf mold, or compost. Although asters are common in garden centers in the fall, when they are visually appealing, the plants need some time to develop a root system before the ground freezes if you expect them to come back in the spring. Plant asters as soon as they’re available in early fall, and keep them moist during any late hot spells to help them settle in. Gardeners often blame the death of an aster the following year on hardiness issues, but many asters perish over their first winter due to heavy soils and poor drainage. If you have heavy clay in your flower garden, plant your asters in raised beds or consider double-digging the soil. Asters are moderate feeders, and they appreciate a balanced flower fertilizer given twice a month from spring until the blooms begin to open. Excessive nutrients can shorten the blooming time, so stop fertilizing asters in August. As is the case with many flowers with wildflower heritage, asters are somewhat drought tolerant; certainly more so than mums. However, long periods of drought cause yellow foliage, so provide supplementary irrigation to equal one inch of rain per week during dry spells. Rust and powdery mildew disease can affect aster foliage. Follow proper plant spacing to improve air circulation, and avoid overhead watering to prevent these problems. Most insect pests leave asters alone, but lace bugs can be a bother. You're more likely to notice the damage they cause than the insects themselves, which are very small and a nondescript grayish-brown color. If you notice yellowing foliage and leaf drop in the summer, consider using insect soap on the plants. Make sure to coat all sides of the foliage to impact the hiding pests. Fortunately, lace bug outbreaks precede aster blooming time, so you spraying won't affect butterflies and bees. Because asters and mums bloom at the same time, you can plan several attractive garden schemes with these two fall perennials. Plant blue asters beside yellow mums; these opposites on the color wheel pop. Combine purple asters and white mums in a garden container. Pair the dainty blooms of a pink aster variety with the larger double flowers of a pink or purple mum for textural interest. Some people are surprised to learn that the aster is an edible flower. As such, they are welcome members of the vegetable garden, where they will draw bees to pollinate the end of the season harvest. Sprinkle fresh aster flowers in salads, or use the petals as a finishing garnish on cooked meats or vegetables.